If you and your partner are in search of a wedding venue that is brimming with meaning, romance, and charm, one of these American historic hotels may be the ideal spot for your wedding. With expansive veranda porches, a victorian spiral staircase, vibrant courtyard, and a history that pre-dates America, The Governor’s House Inn is the number-one hotel wedding destination on our list. The Georgian double house was built in 1760. Soon after its completion, Edward Rutledge, the youngest signer of the declaration of independence, leased and then purchased the property and lived their until his death. 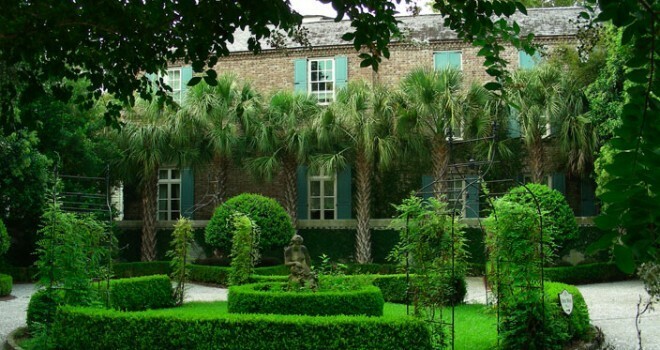 The Governor’s House Inn’s beautiful courtyard. Conveniently located in the heart of Charleston, The Governor’s House Inn situates guests within walking distance of the city’s Old Market and a vast array of legendary historic homes, which can be toured individually or all together via horse and buggy. A living historical landmark and luxurious bed and breakfast, The Governor’s House Inn is the perfect place for couples to experience a piece Charleston’s romantic history firsthand, while exchanging their marriage vows. 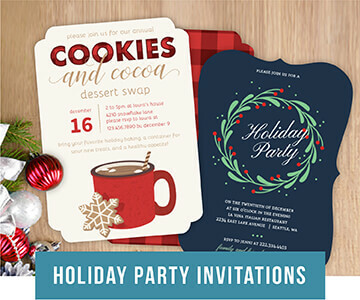 If you’re planning on making The Governor’s House Inn your wedding destination, consider setting the mood for your warm, austral affair with colorful custom southern wedding invitations from PurpleTrail.com. A few steps away from Waikiki Beach stands the Moana Hotel, the first large hotel opened in Waikiki. 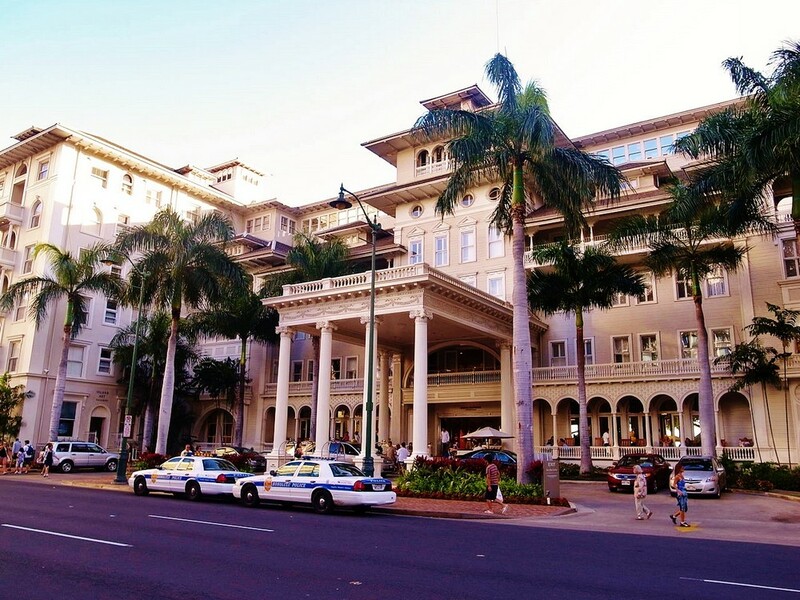 The hotel first opened it doors to guests in 1901, just as Honolulu was gaining recognition as a tourist destination. It is the only hotel in Hawaii that reflects the Beaux-arts design of the 1900’s. Moana Surfrider Hotel — Honolulu, Hawaii. The hotel has evolved in many ways since then, but much of its charm still remains. Consider tying the knot among the hotel’s Banya tree — one of the first to be listed on the Hawaii Rare and Exceptional Tree List. Planted in 1904, the tree has been their nearly as long as the hotel and has grown along with it — standing 75 feet high and stretching 150 feet across. Construction of the Stanley Hotel began in 1906 by Freelan Oscar Stanley — the creator of the Stanley Steam Engine. The hotel is most famous for being an inspiration piece for Stephen King’s The Shining. King and his wife stayed at the hotel for a night. And, although he did not write The Shining specifically about the hotel, the historic haunt’s scenic mountain views, haunted history, and spectacular size and architecture are apparent in King’s spine tingling novel. The Stanley Hotel — Colorado. There have been many reports of ghost sightings at the hotel. The most famous being Stanley himself. Mrs. Stanley has also been sighted a number of times by guests. Room 407 is considered the most haunted room in the hotel. Many visitors report ghostly experiences such as flickering lights, cold spots, and more. 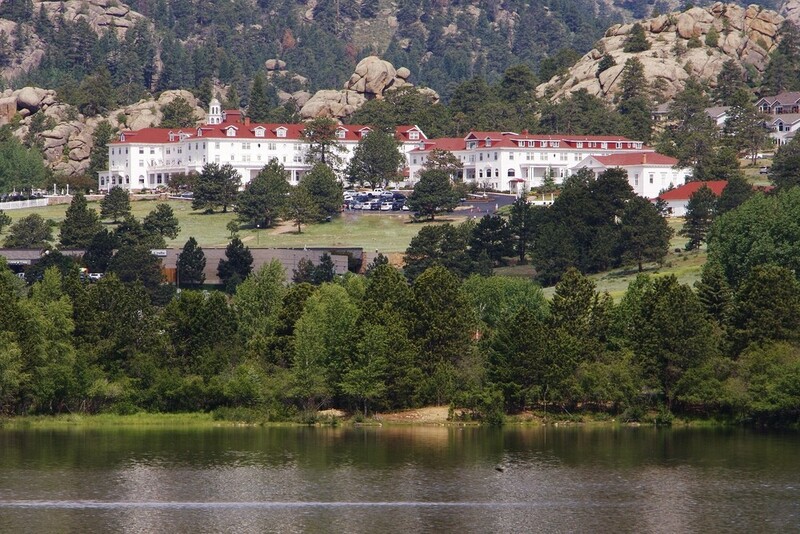 Located only six miles away from Rocky Mountain National Park, the hotel is graced spectacular views in every directions. The Stanley Hotel is as beautiful as it is haunted and quite extravagant to boot — a perfect spot for a Halloween wedding. Be sure to get Halloween wedding invitations to match! Surrounded by thousands of acres of unspoiled natural beauty, a sparkling glacial lake, and award winning gardens, Mohonk Mountain House is a 145-year-old victorian castle resort that will make your wedding day truly unforgettable. What started as a ten-room inn and tavern, built on 280 acres of land, has grown into a grande historic hotel with room for 600 guests and a breadth that stretches about an eighth of a mile long. 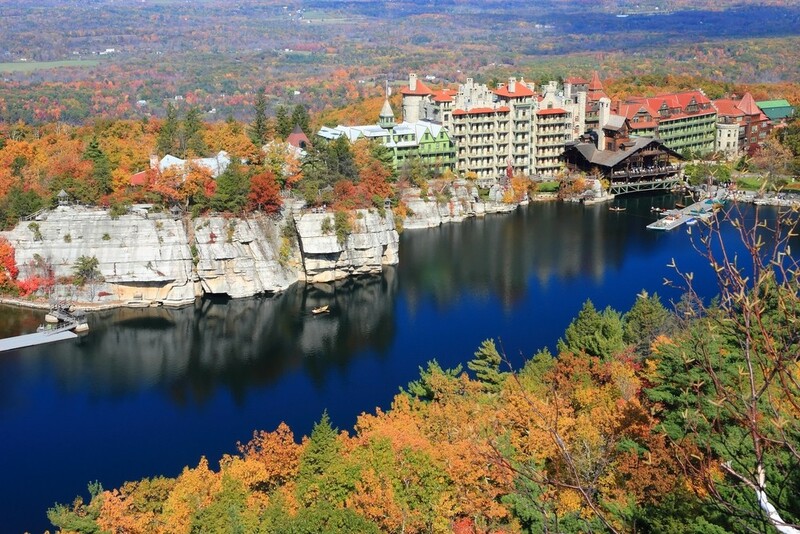 The blue sky and the Mohonk Mountain House resort reflected in Mohonk Lake and surrounded by sandstone cliffs and colorful Autumn trees in the Shawangunk Mountains of New York. With plenty of activities to partake in (tennis, horseback riding, carriage rides, and golf) and an ever-changing lineup of speakers and lecturers, guests will be happily entertained throughout their stay. Guests can also visit the Barn Museum, built in 1888, or take a tour of the hotel to learn more about the resort’s rich history. Rich with beauty, history, and amenities, the Mohonk Mountain Hotel is an ideal setting for any happy couples’ special day. The Timberline lodge was built completely by hand, from local stone, as part of Franklin D. Roosevelt’s Work Projects Administration. It opened to the public in February of 1938. The national landmark is perched 6,000 feet up on Mt. Hood. Timberline is home to America’s longest ski season — and in the height of winter, the ground floor of the lodge is typically buried in snow (guests must enter through a snow tunnel or via the second floor). Timberline Lodge Mt. Hood, Oregon. 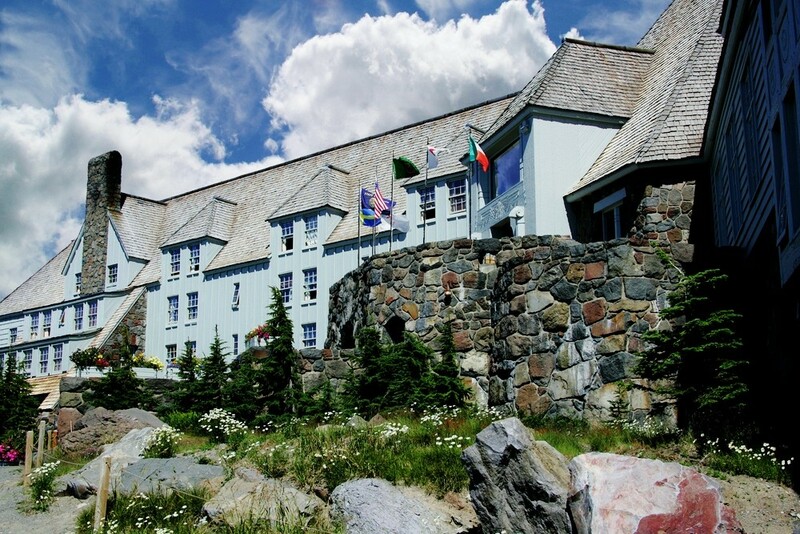 The scenic mountain views, snow-white winters, and charming Cascadian architecture make The Timberline lodge perfect for any outdoorsy couples’ wedding. Introduce your guests to the pleasant destination wedding ahead with rustic inspired wedding stationery. 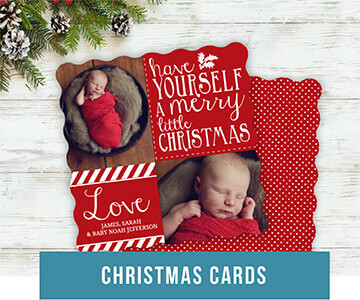 Peruse our premier collection to find a design that suits your taste. Hopefully you’re feeling inspired! If there are any beautiful historic hotels that we missed, please let us know via the comment section below. We would also love to hear about your historic hotel wedding experiences, or if you’re are planning on having one. 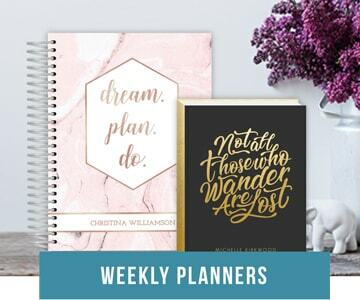 Good luck planning for your big day!